​Hometown: Pitman, New Jersey, U.S.
Died: March 30, 2003 in Operation Iraqi Freedom. 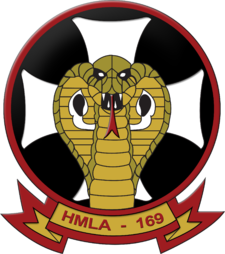 Unit: Marines, Marine Light Attack Helicopter Squadron (HMLA)-169, Marine Air Craft Group-39, Marine Corps Air Station, Camp Pendleton, CA. 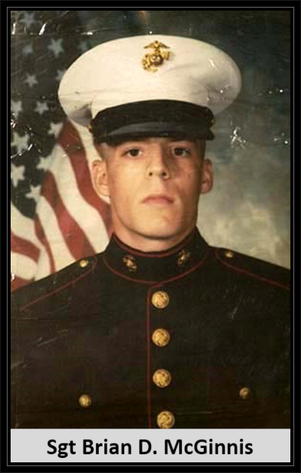 Marine Sgt McGinnis was assigned to Marine Light Attack Helicopter Squadron (HMLA)-169, Marine Air Craft Group-39, Marine Corps Air Station Camp Pendleton, California. 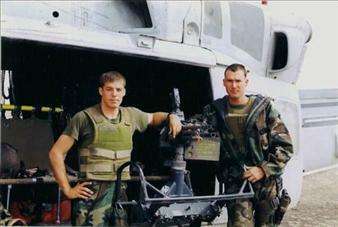 McGinnis was killed in a UH-1N Huey helicopter crash in Southern Iraq. Brian's high school wrestling coach in New Castle, Delaware, tried to persuade him to attend college, but he had other plans. He said the Marines were the best, and that's what he wanted to be a part of. Brian, who was married to his high school sweetheart, joined the Marines in 1998. He was supposed to leave the Marines in March, but the war stopped that. He wanted to get a job and start a family - do it right. Megan, Brian's wife, said she cherished: a honeymoon trip to Walt Disney World, weekend trips to Wildwood, New Jersey, the senior prom, their wedding day, his smile and laugh, his love of the Philadelphia Eagles, his motorcycle, the "best hugs in the world," his love of nature and his love for going up in the helicopter. Brian is remembered as a practical joker, a trusted mentor, a brother, and a hero. He had just gotten his crew wings Saturday, the day before the accident. Marine Sgt. 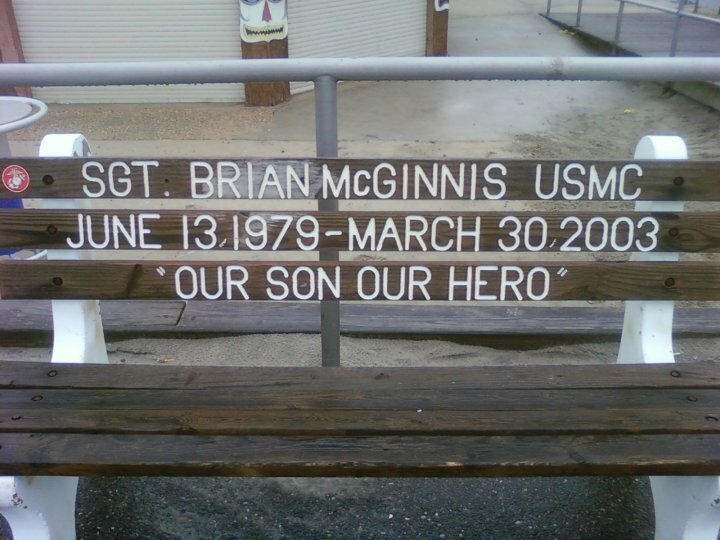 Brian McGinnis was a graduate of William Penn High School in New Castle, Del. It was there he met Megan Mahoney, whom he married in 1999, a year after joining the Marines. His high school wrestling coach tried to persuade him to attend college, but McGinnis had other plans. "He said the Marines were the best, and that's what he wanted to be a part of. He welcomed the challenge," said the coach, Jack Holloway. McGinnis, 23, of St. George, Del., died March 30 in a helicopter crash. "He had just gotten his crew wings ... the day before the accident," said his mother, Mildred Williams. "I am sure it was a big moment for him. He just loved flying."